One of the girls especially is all excited when I come to their house and show my new jewelry, new beads or even start making something. I bring her beads regularly, and she insist on all doing it herself. She does not have a lot of patience yet, so it is a bit of a challenge, but she loves all craft projects in general, so I am sure she will be one of us. Regarding Nick - I am more forcing him to become a lover of beads.... "honey how do you like this...?" 5 Response to "Emanda's challenge"
Thanks for the heads up about the giveaway. As far as thread length, I just use a thread that I'm comfortable, maybe about 4 feet, and I double it over alot, only leaving about 4 in. of single thread right in front of where I'm working. I'll simply knot in new thread when I need it, and then thread the old one into the new beadwork. Some people don't knot, but if it's a piece that I'm going to sell or give I feel like it's necessary to knot the piece b/c of the extra strength. Thanks for the question. But my advice to you would be to do what feels comfortable to you and what's easiest. Someone else's technique only works if it works for you! Wonderful post Nicki! You made my day today! Thank you for visiting my blog and your nice wishes...my dearest hubby is doing much better now. 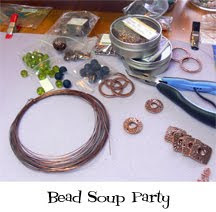 Since I have a love for beads and for bead work and jewelry making I find your blog most interesting and I am now one of your followers. I wanted to tell you that I've passed on the Sunshine Award to you! Please visit my blog for details! Congratulations! I've just returned from my retreat and noticed you had commented on my blog and posted aboiut it. Thanks so much!! I'm so glad you spread the beady goodness to your nieces and nephews and your boyfriend. Isn't it great! You nare entered three times in the give away.